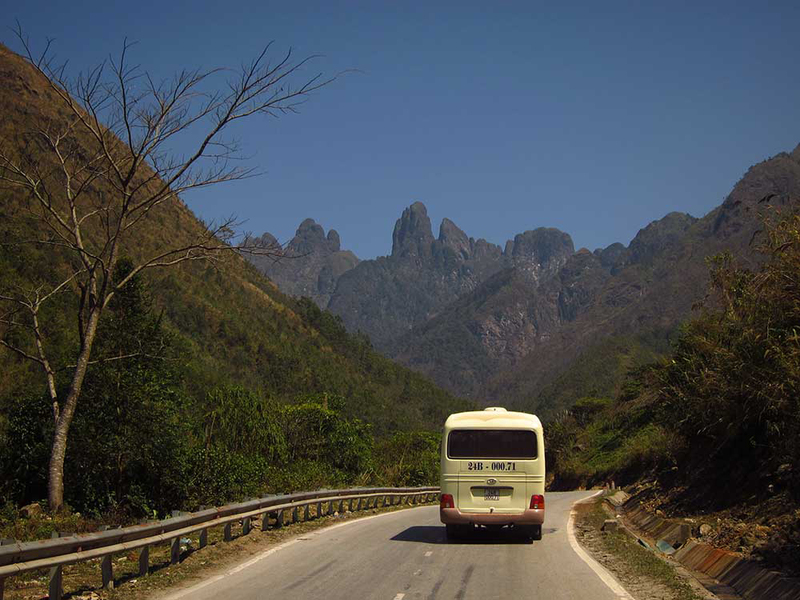 The idea for this road trip came from a Hanoi local who, because of his teeth, was nicknamed ‘Vamp’. We met Vamp when he helped us fix our flat tyre on the Ho Chi Minh Highway. 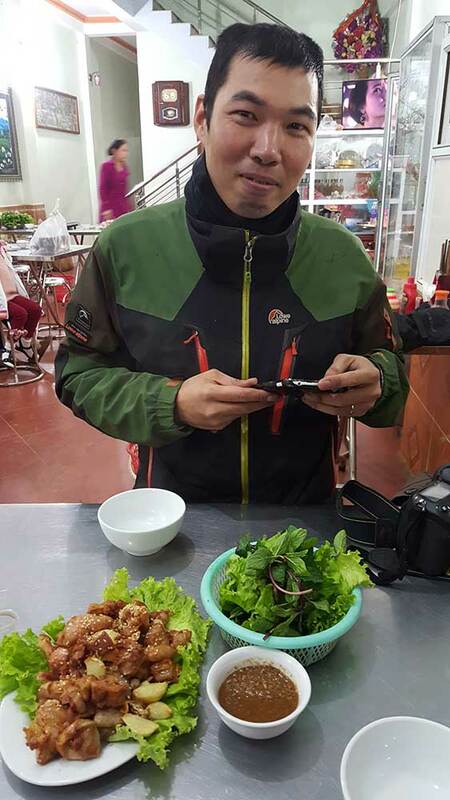 In Hanoi we met him again and chatted over over cups of ca phe trung to discuss motorcycling around Vietnam’s northern provinces. 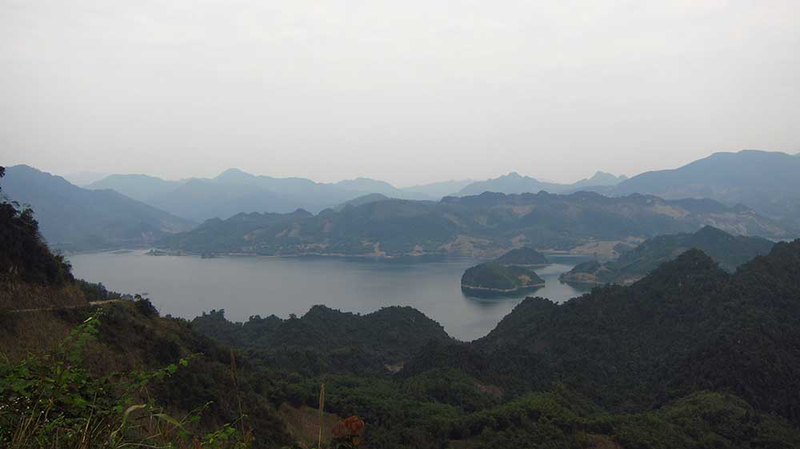 Vamp does as much traveling as possible on weekends and holidays and is a goldmine of information about Vietnam’s best passes, back-roads, and hidden gems. 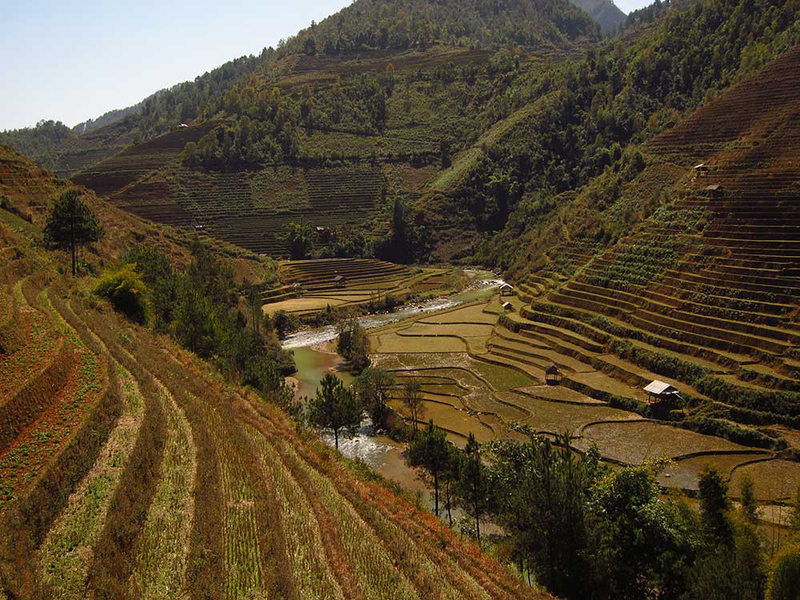 He came up with an amazing alternative drive to Sapa, which I now share with the world. This is the first time I’ve attempted to write a ‘guide’. It’s not usually that kind of blog, but here goes. Escaping Hanoi at peak hour went as smoothly as one might expect, but I managed to not crash or have a mental breakdown. Eventually we reached quieter roads. 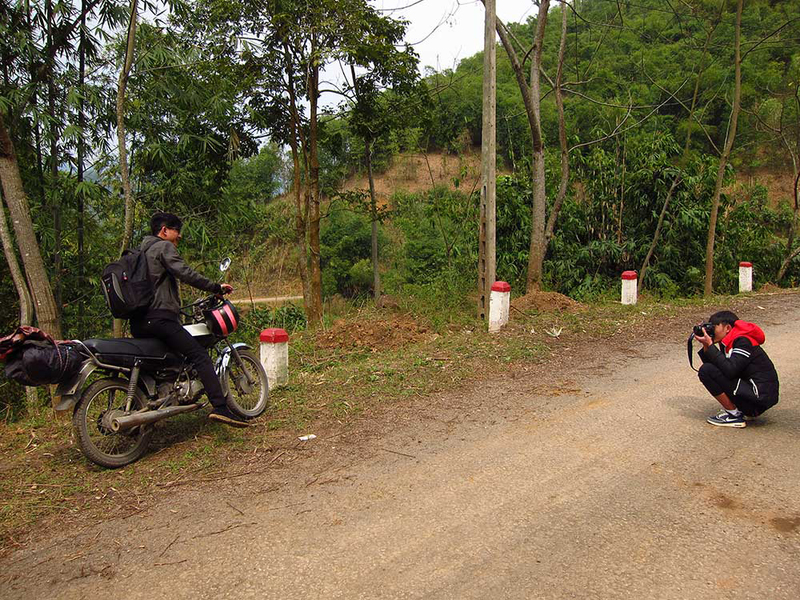 It doesn’t matter where in Hanoi you leave from, you want to get on the AH13 highway. 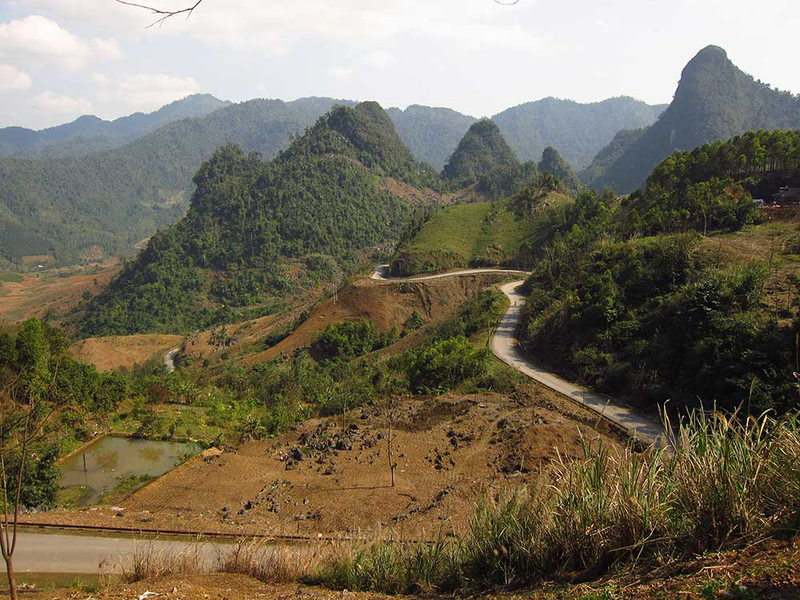 Once you hit this road you’re good all the way to Mai Chau. 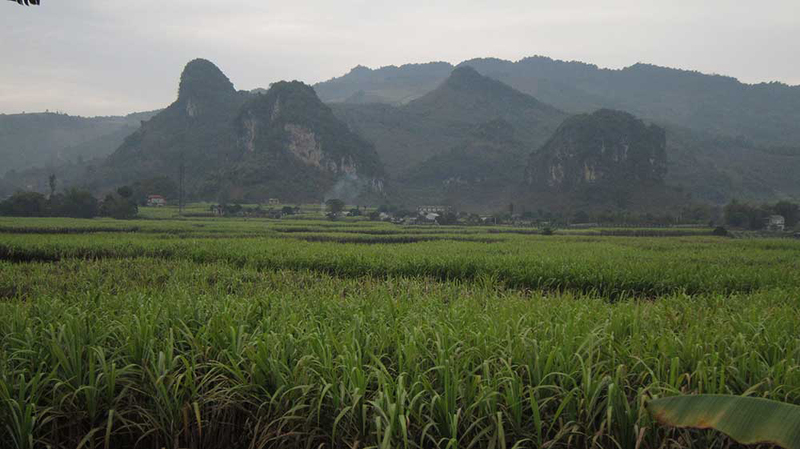 The roads are generally excellent, and you’ll be finding yourself in sugar country after an hour zipping by fields of sugarcane and, in our case (late winter), bundles of freshly harvested stalks drying up against makeshift shelters. 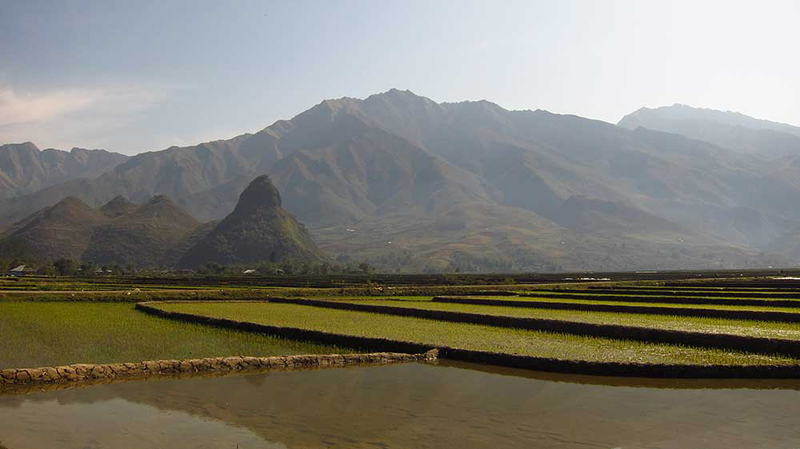 One interesting diversion we came across was in the small town of Cao Phong. 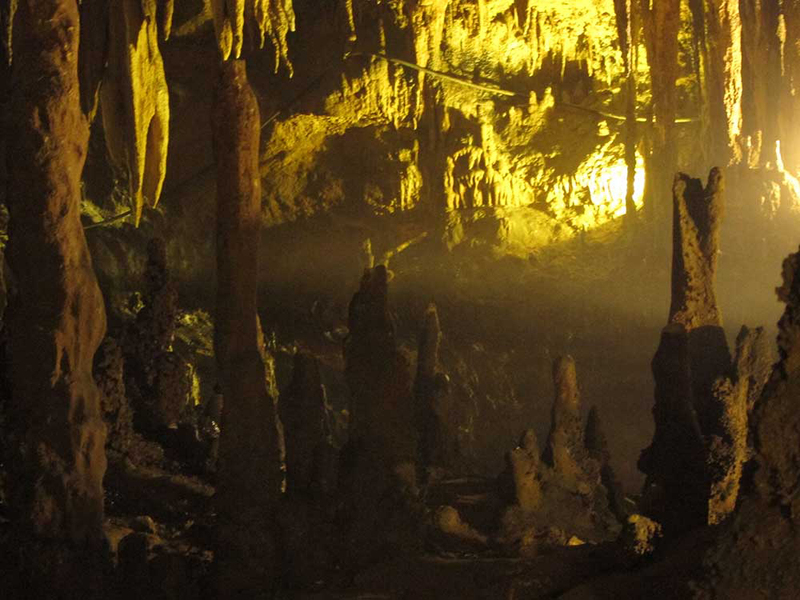 The entire area has a generous scattering of limestone crags, and this means plenty of caves. 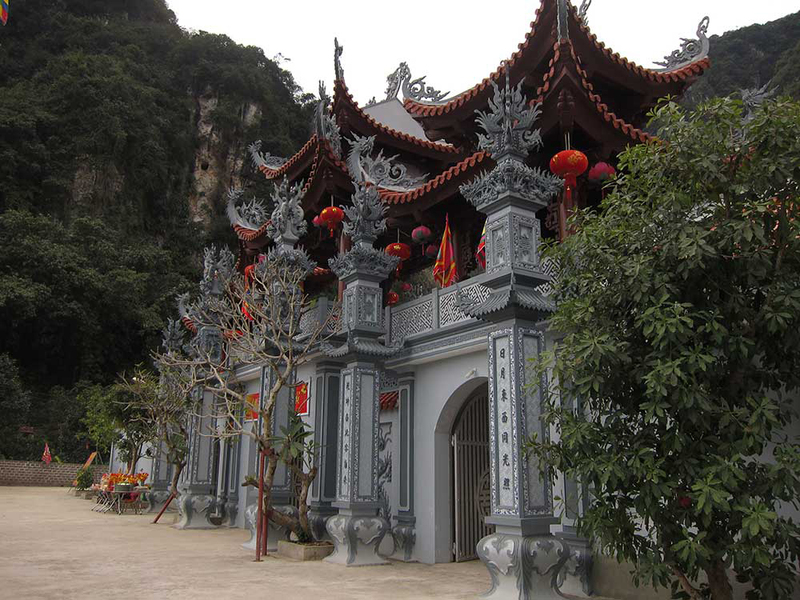 There is a beautiful, newly constructed Buddhist temple called Đền Bồng Lai sitting in front of a particularly large outcrop, and climbing some steps behind the temple leads to a cave system. 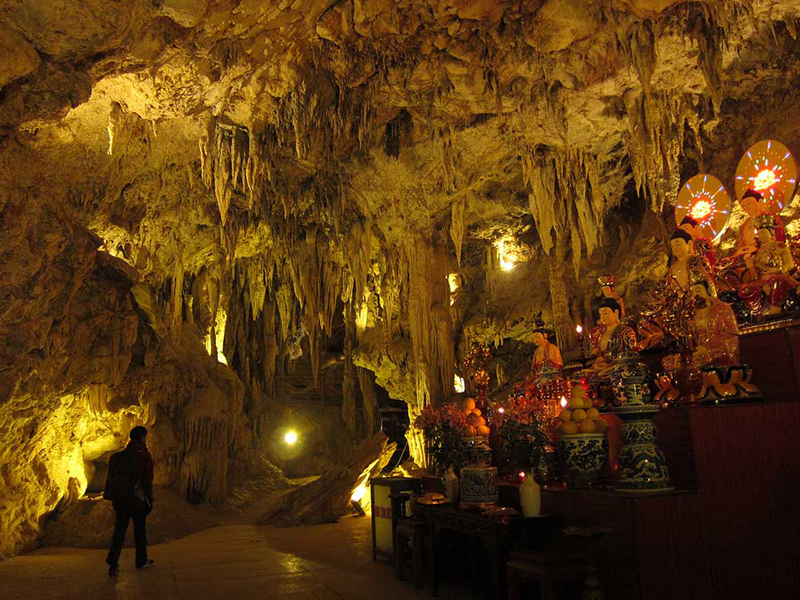 The entry fee to the caves is 10,000 dong (less than $1) and that price includes a guide – although don’t expect them to speak any English. You pay $5000 dong to park your bike – the standard fee. The photo is blurry, but I added it to show the steam. As you get further down into the caves the temperature increases and it becomes steamy and humid. Outside was cold and raining. 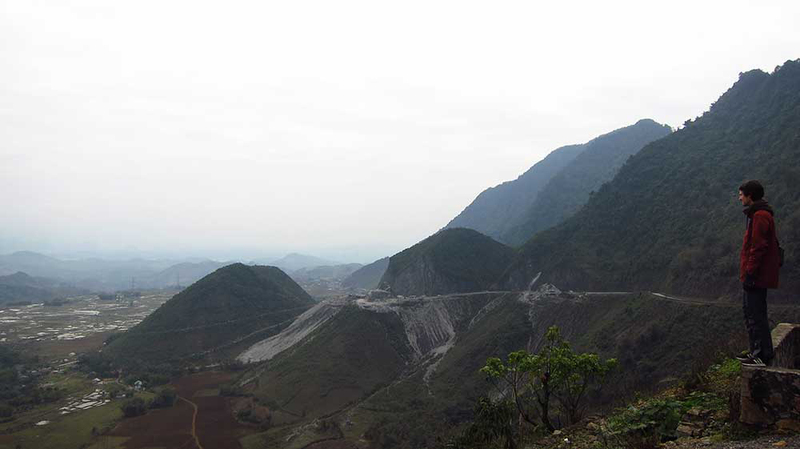 After Cao Phong you’ll continue on the AH13 as it makes a few small climbs through rocky passes. 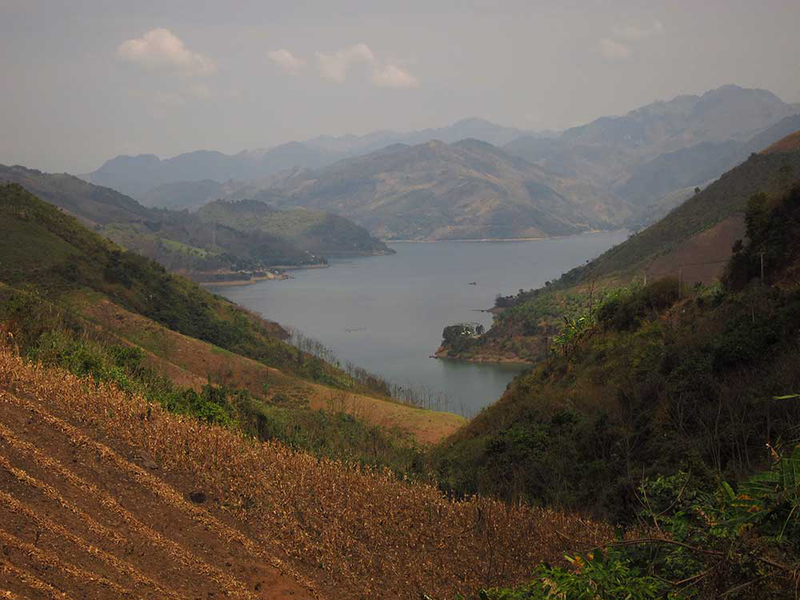 Several times during this stretch we’d turn a corner and both exclaim in amazement at some incredible, endless view of layered mountains or staggered paddy fields. 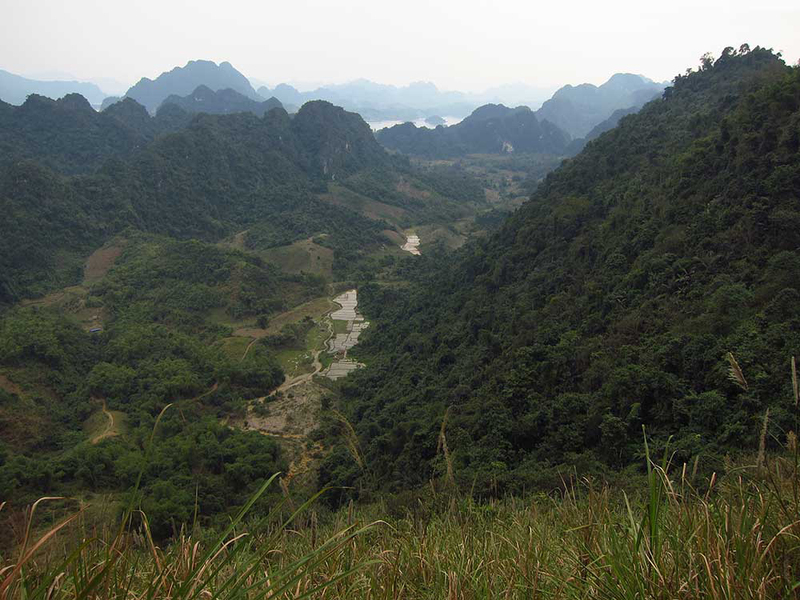 But the real treat is saved until last: the Thung Khe Pass. 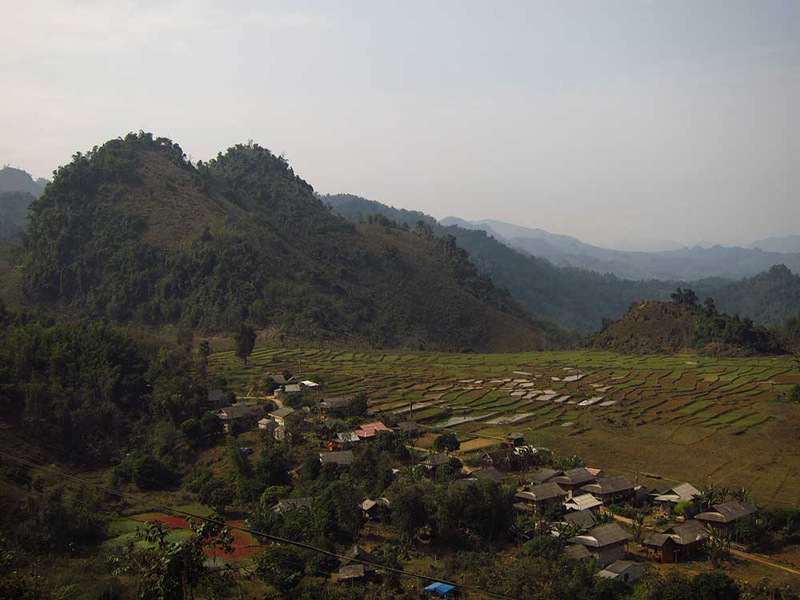 There is a huge range of accommodation in Mai Chau. 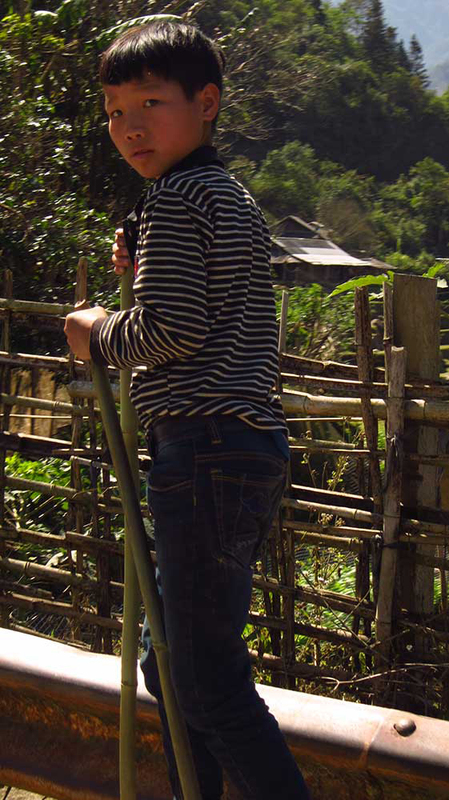 We chose (as we usually do) cheap and obscure, and stayed at the Hoa My Guesthouse (Nhà Nghỉ Họa My). It was clean, quiet, and had hot water and very warm blanket (necessary in winter). It cost 200,000 dong. No frills. Possibly no other guests. Are you ready? You now have to backtrack for 19 km. I know, I know, but trust me – it’s worth it. And hey, it’s not like you’re backtracking over a boring road. 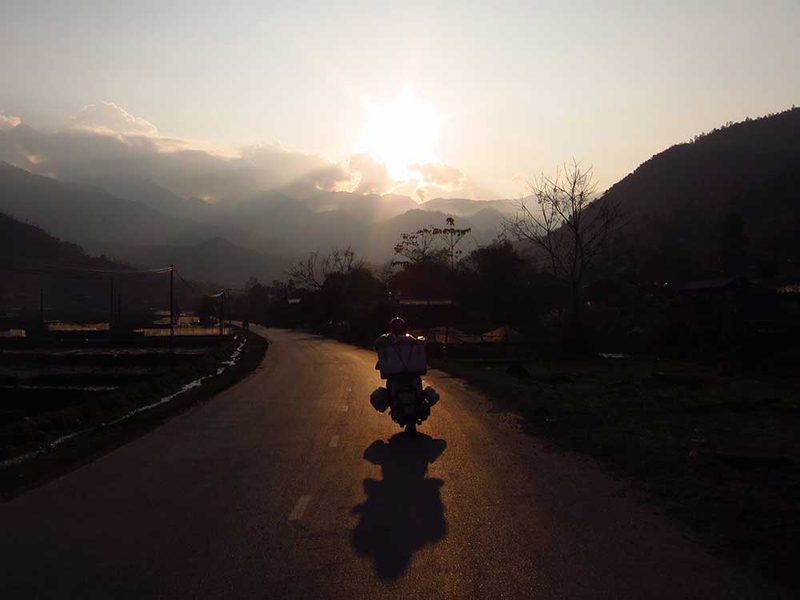 You’re traversing the Thung Khe Pass from the other direction and it is just as wonderful the second time. See that valley far below on your left? Soon you’ll be driving through it. 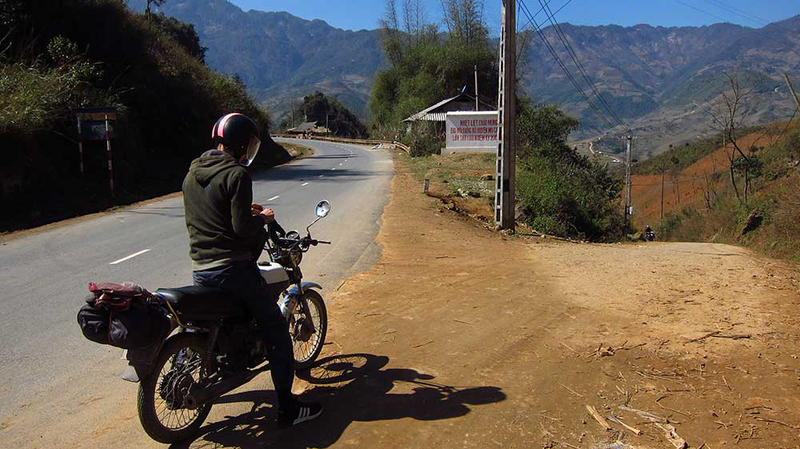 At the foot of the pass there is a turning to the left just before a petrol station. 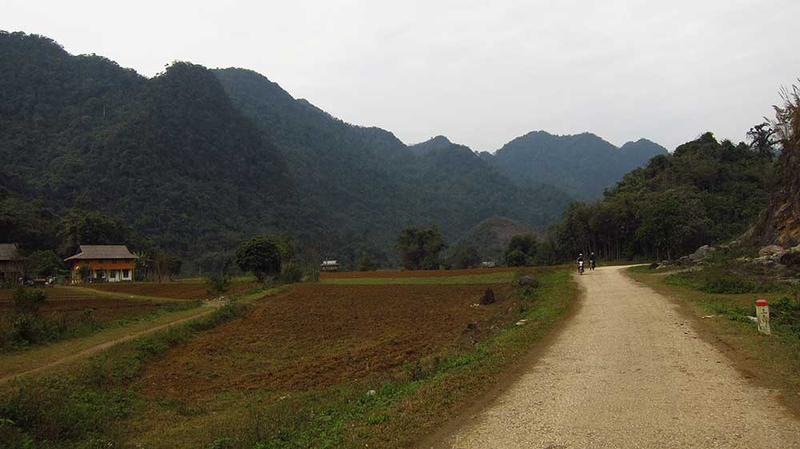 This road is called (on Google Maps) Phú Cường and as promised, it leads through the valley and in between the mountains. 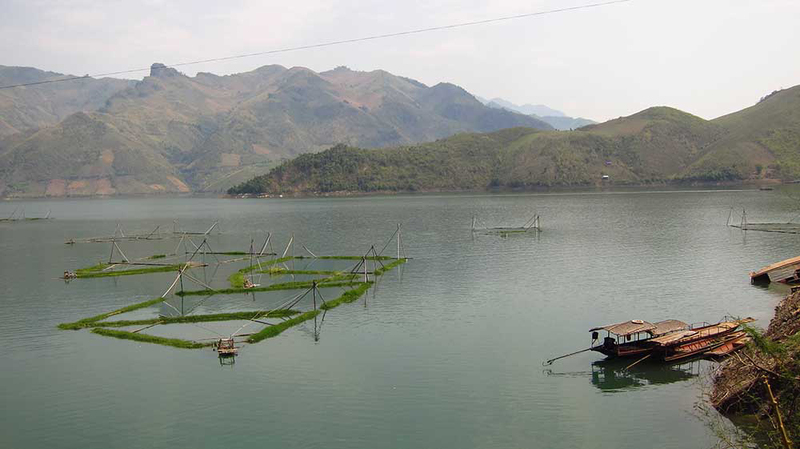 Kids will be waving as you pass by farming communities and flat fields full of jagged stones, and after about 20 minutes you’ll discover what those mountains were hiding: a flooded section of the 1000 km Black River dotted with islands and a backdrop of even more layered mountains. Follow the road all the way around the rivers edge. 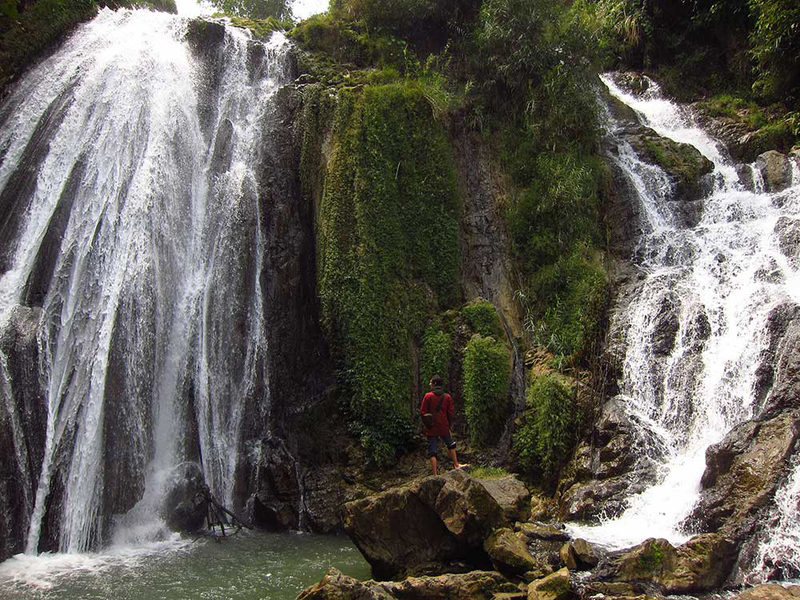 This make take a while because of all the photo stops, but eventually you will reach the Thác Gò Lào waterfall. This can be accessed by a set of dirt stairs in the little village it flows next to. Mind the cows on the way down. Apparently our bike was something of a novelty. From here you have a choice. We turned left and followed the road back to meet up with AH13. You can also turn right and follow the mysterious, windy path of pot holes and rocks. Perhaps you will find a great adventure that way. 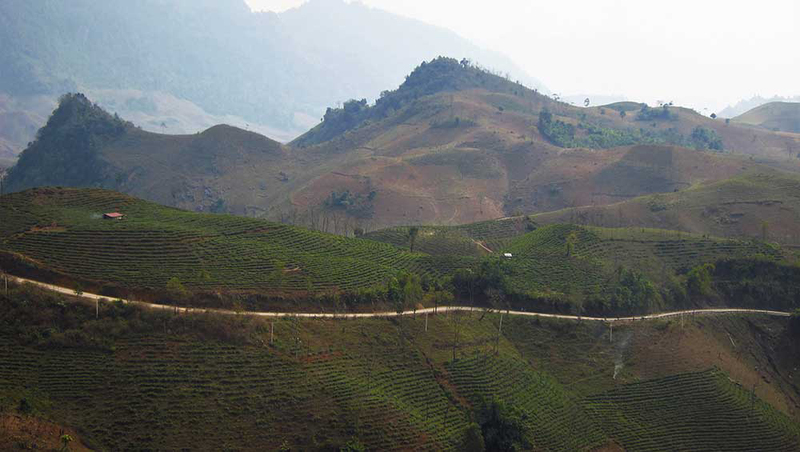 If you return to AH13, the rest of the trip to Mộc Châu is rather uneventful. 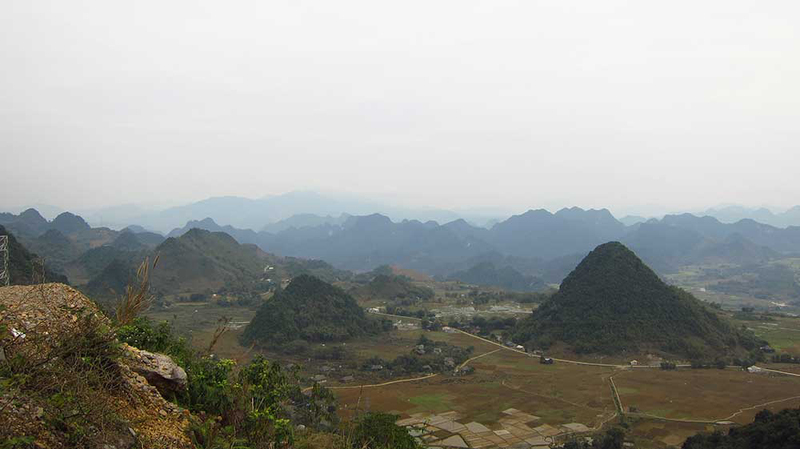 When we traveled through there was plenty of construction and mining along the way as well as a large number of weekend trippers from Hanoi. We arrived mid-afternoon in Mộc Châu and stayed at the Hai Nam Guesthouse. It was 200,000 dong, clean, and quiet at first, however late in the evening a shuttle van pulled up. If you’ve biked in Vietnam you will reconise this particular type of van as ‘the vans who are always trying to kill me’ – aka the silver Mercedes shuttle with the musical horn. It was full of Vietnamese tourists and they took over our floor to host loud meetings directly outside our door until late in the evening. The room was icy cold, the power went out intermittently, and the bathroom began to smell freaky after a couple of showers. The owners, however, were very lovely and gave us free bottles of water, so it wasn’t all bad. Today is the big one. If you have a motorcycle that isn’t crap (unlike ours) then 218 kilometres shouldn’t be too big a deal. It’s a slog, but it crosses such varied and interesting scenery that you will hardly be bored. There are also a lot of places where you can potentially get lost, but if you follow the map you should be fine. Head east on highway QL43. The town slowly peters out and as you turn north you find yourself facing a deep valley. The road winds its way along the side of various mountains staying relatively flat. There are a few pot holes in the section so your eyes will be mostly on the road, but there are plenty of opportunities for photo stops along the way. There are several diversions to other places along the way, but if you stick to QL34 you will eventually spy a large body of water in a distant valley. Once again, you’ve reached the Black River. The river is huge, stretching all the way into China, and if you follow the road all the way down you won’t find a bridge, but the small Van Yen ferry. I’m fairly certain the ferry doesn’t operate to a timetable, but we only had to wait five minutes for the crossing along with three other motorbikes. The cost was 15,000 dong per bike, which contradicted the signposted price of 2,000 for each person and 3,000 for each bike. We took note, and everybody else seemed to be forking over 15,000 dong as well. Crossing the Black River took less than five minutes. Safe on the other side, you will now follow a northbound branch of the Black River until it eventually dwindles to nothing. 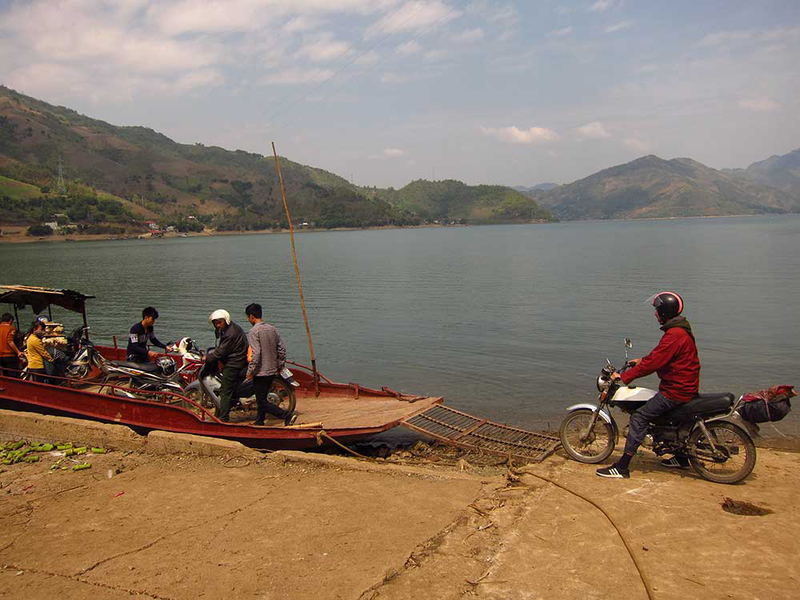 The whole route seems to be one very long, sparse fishing village, and the road is flat and winding. You’ll be fighting with yourself to stare at either the pot holes in the road or the stunning hilly formations on the opposite bank. 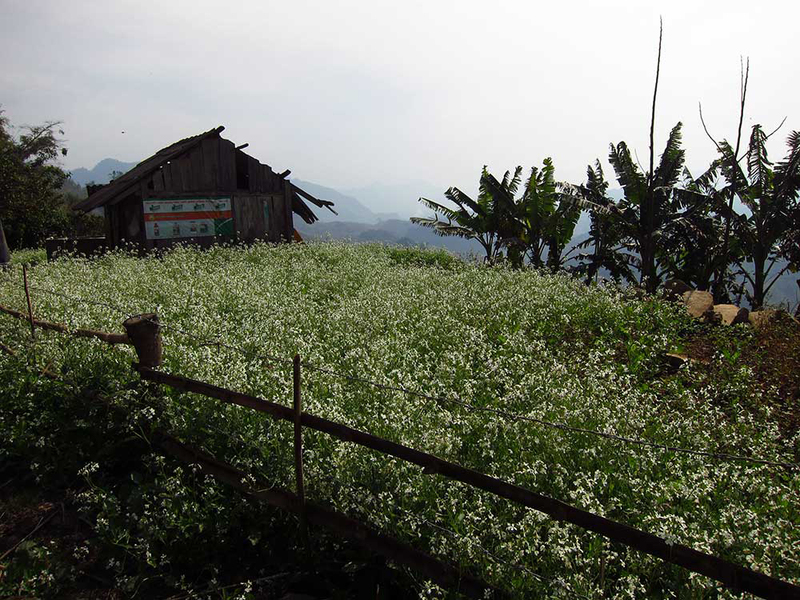 When you reach Gia Phù, take the right turn up highway QL37 and follow this all the way. This section passes a beautiful winding road from the top of a mountainous crop all the way down to a valley of smooth hills. There are a couple of forks that may try to trick you – just check the map and you’ll be fine. 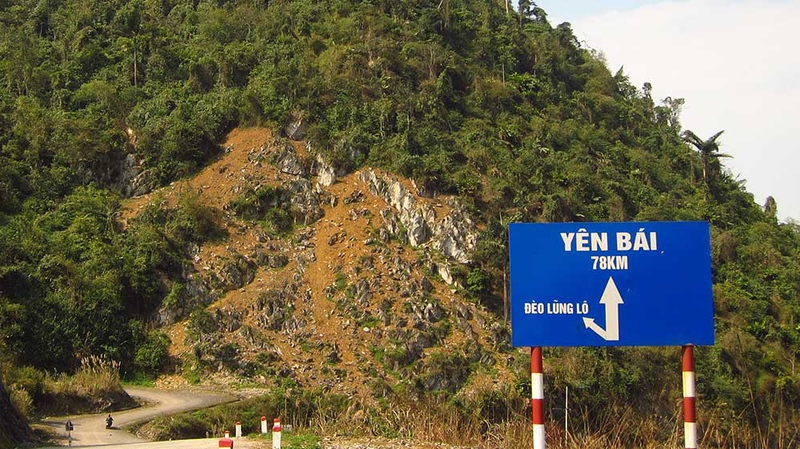 When you hit highway QL32, turn left (turning right will take you back to Hanoi). 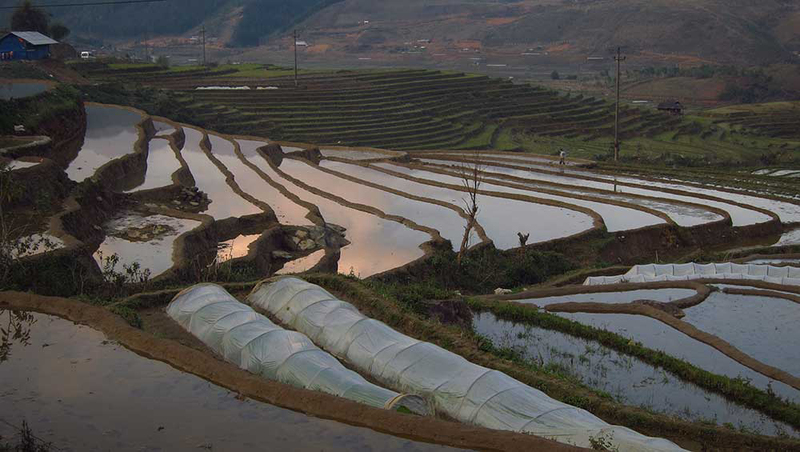 It was planting season, so all the paddy fields were strictly water. We went full luxury for our lodgings in Tú Lệ, and spent 300,000 dong at the Pho Nui Guesthouse (Nhà nghỉ Phố Núi). If you want a super-comfortable and clean place after your long drive, we can highly recommend this guesthouse. There was an ever-so-slight karaoke infestation, but other than that it was very peaceful. Today is a much shorter drive, but that’s probably a good thing since there are so many photo opportunities. 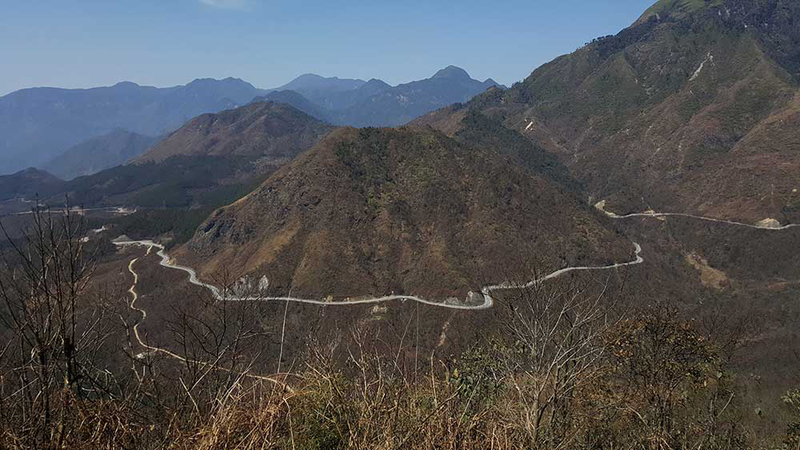 Practically the first thing you do after leaving town is traverse a spectacular pass over the Lim Mong valley (hey, that’s the header picture! 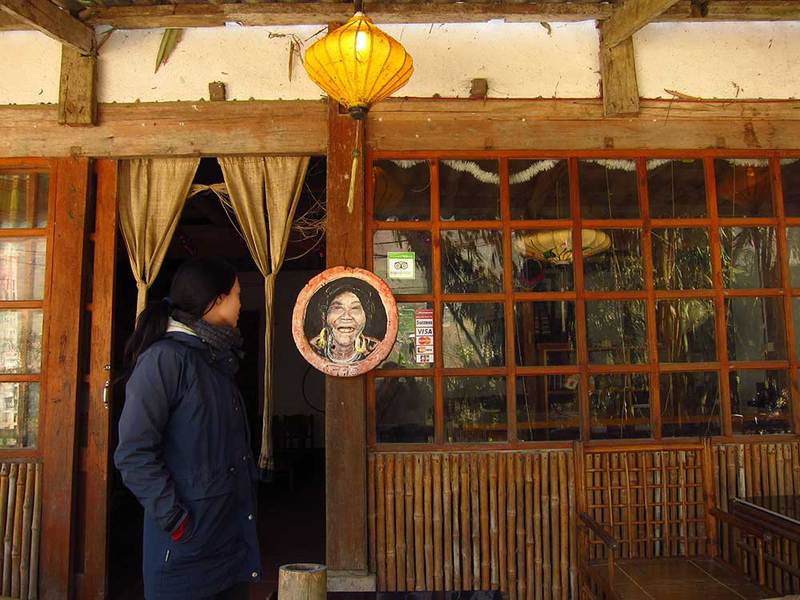 ), but before you do there is a little village that begs exploring. 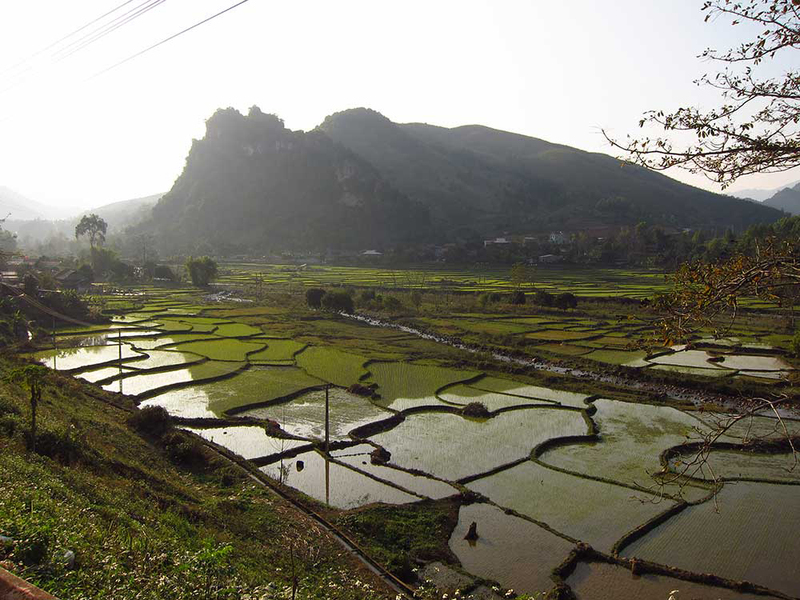 About 3km from Tú Lệ there is a fork in the road that leads down to the village of Lim Mong. 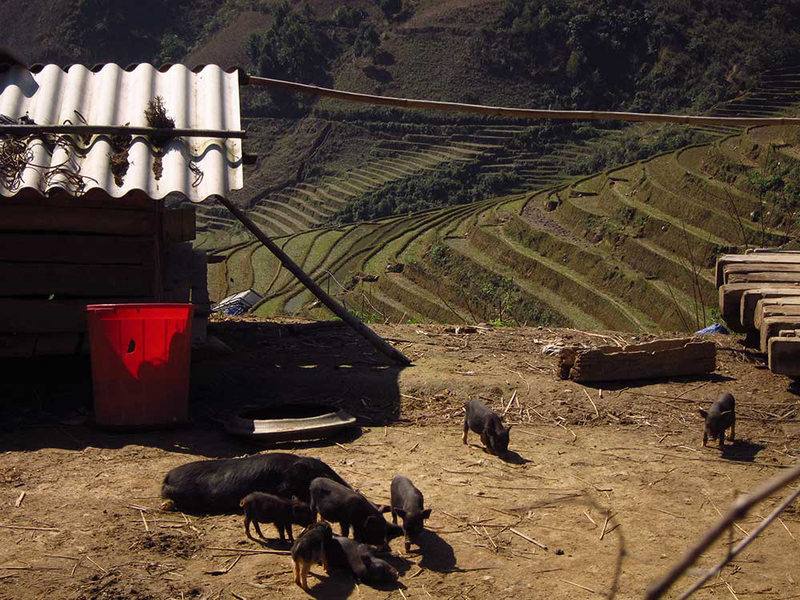 The village is filled with the daily happenings of the H’mong people; driving trucks, planting rice, digging paddy terraces, and farming very small pigs. 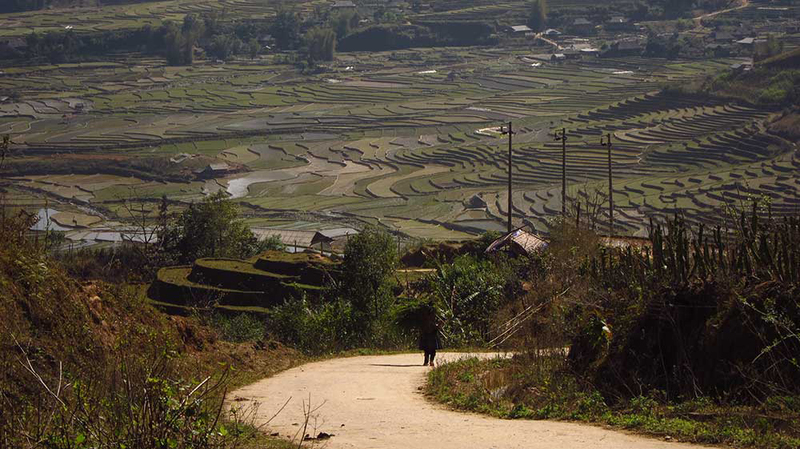 The road through the village leads up the other side of the valley and gives you a spectacular view of the terraced paddy fields. After that you’ll need to backtrack to the main road. 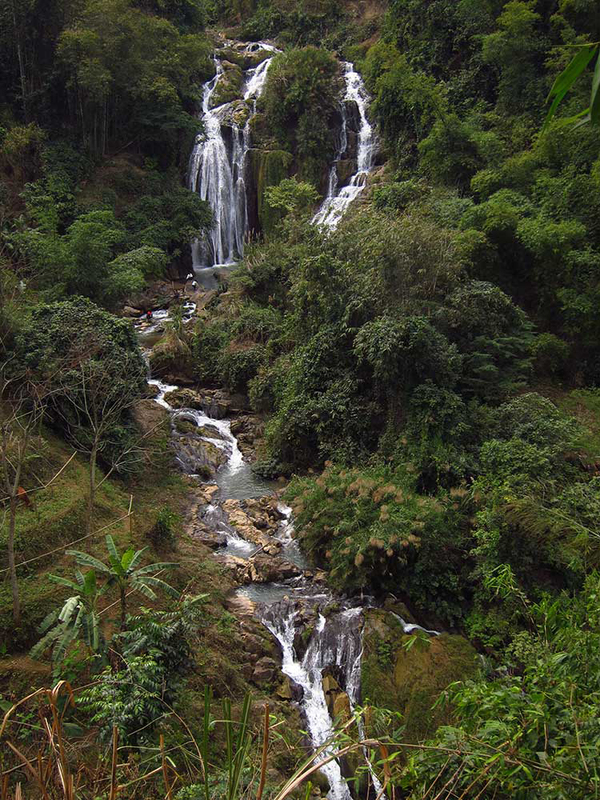 The pass sweeps around the entire valley by waterfalls and sheer drops. 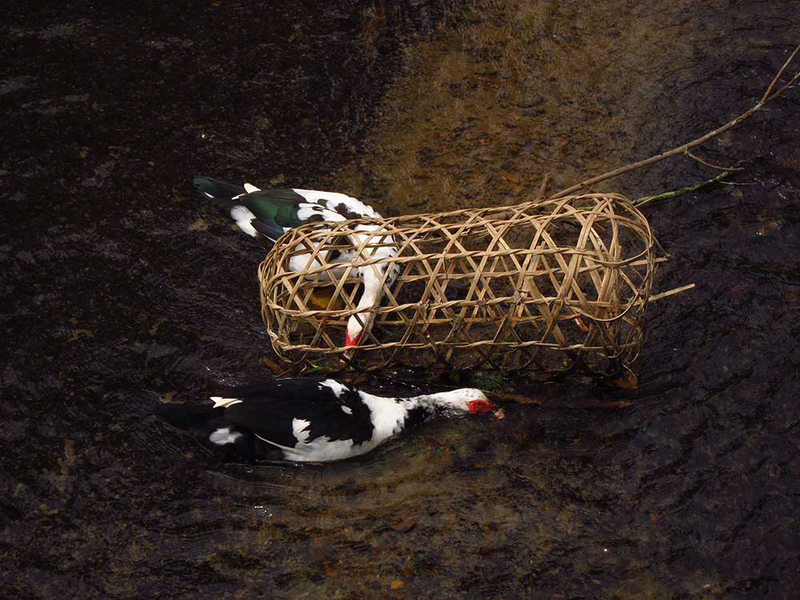 The deep valley narrows and snakes into a rocky river far below, and the tribal people stand around admiring the view between hauling loads of firewood in their woven baskets. Here’s the sneaky turnoff. Turn right and head down the very steep road. Looking back on the road we’d already passed. 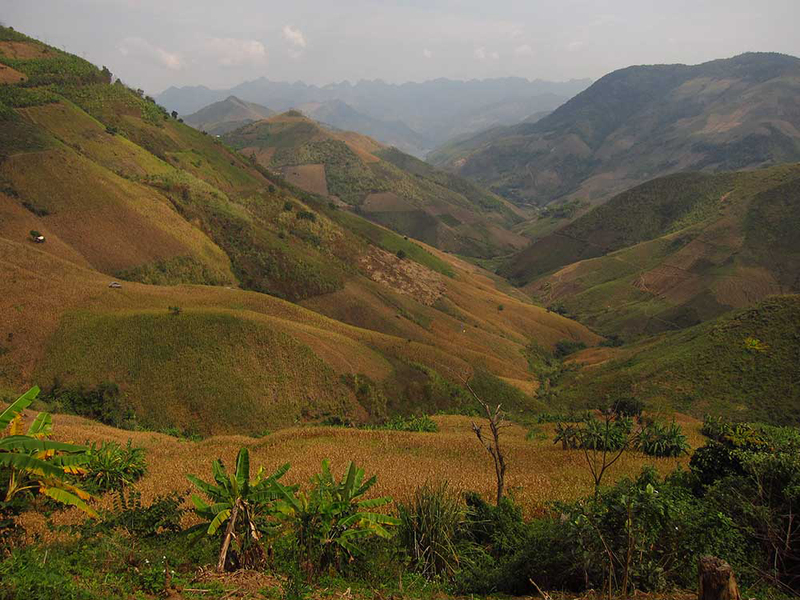 Somewhere down there was a Belgian cyclist who’d come all the way from Bangkok through Laos. What an animal. This breast-feeling man was delighted to chat away to us at the top of the pass – “Six years and no children?” he exclaimed. Yeah, we’ve heard that before. The top of the pass was only about 20 km into the drive, but it took us almost three hours with all the photo stops and detours. 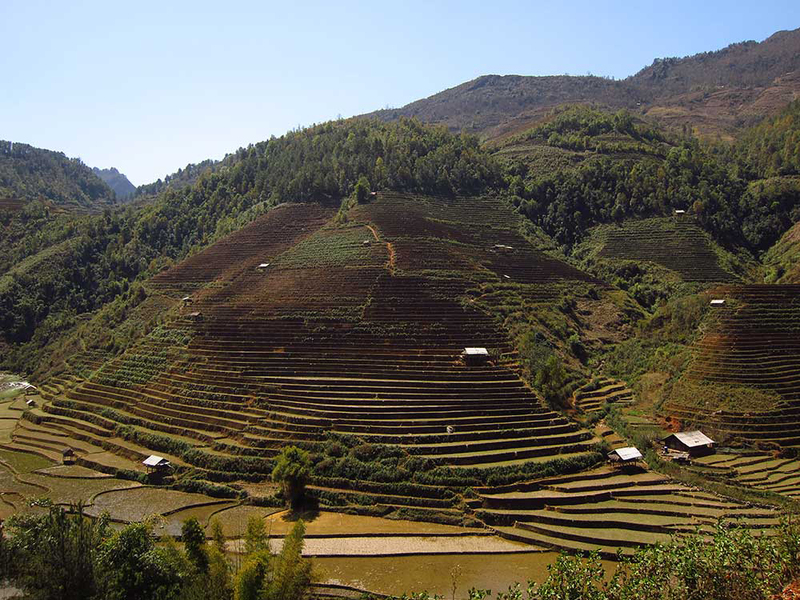 Going down the other side reveals – you guessed it – more terraced hills of paddy. If you thought you’d seen some beautiful fields yesterday, get ready to say, “Whoooar” a lot today. We stopped and ate lunch overlooking a valley of rice and rivers. 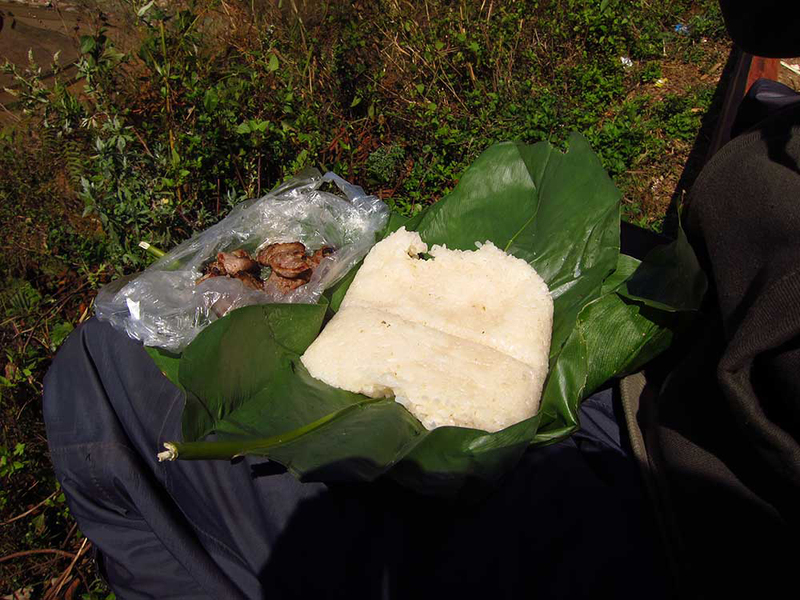 A man stopped by and jabbered away happily to us as we ate our Xoi – a sticky rice specialty in Tú Lệ that we had brought that morning to take away. He was posting a letter, he told us over the course of ten minutes. And a view for dessert. From there the valley keeps heading down past terraces increasing in impressiveness. 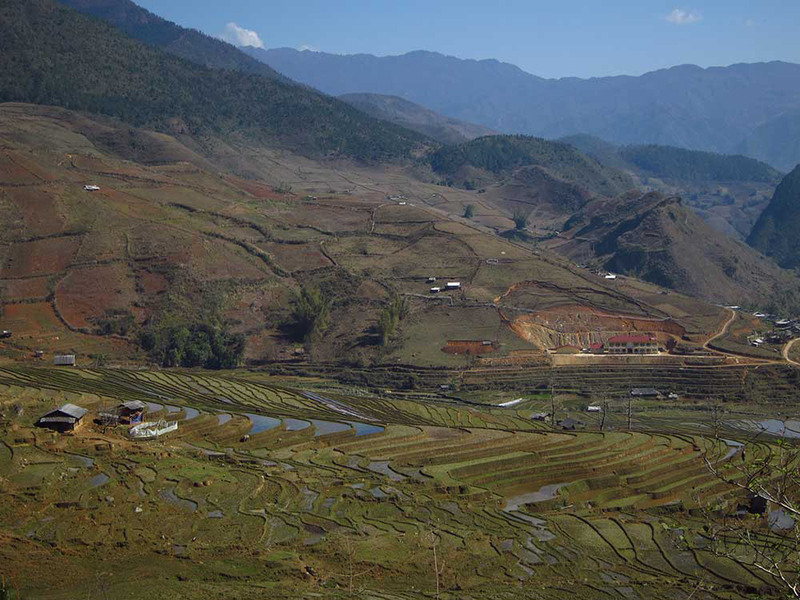 Eventually the rice villages turn into mining and construction villages. A small nameless river runs beside the road and it is filling up fast with dams. 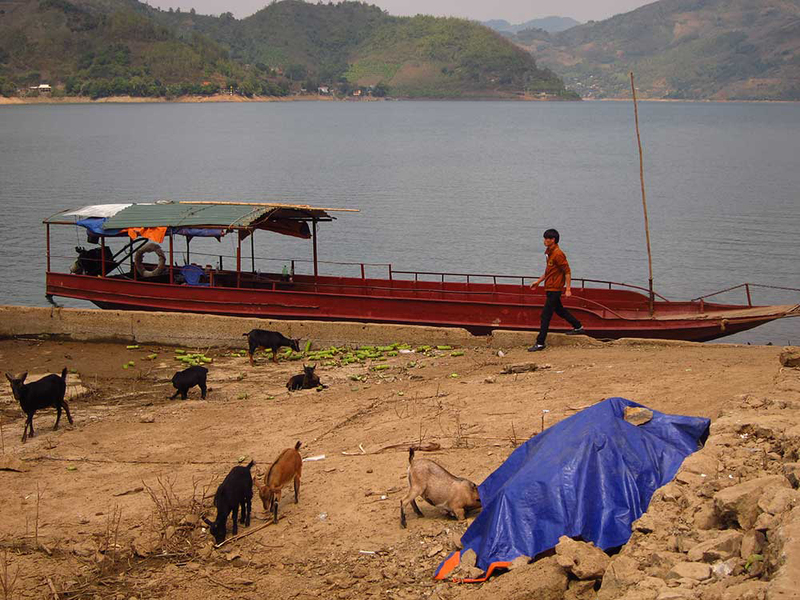 We saw three completed dams and three more under construction in a 30 km stretch. 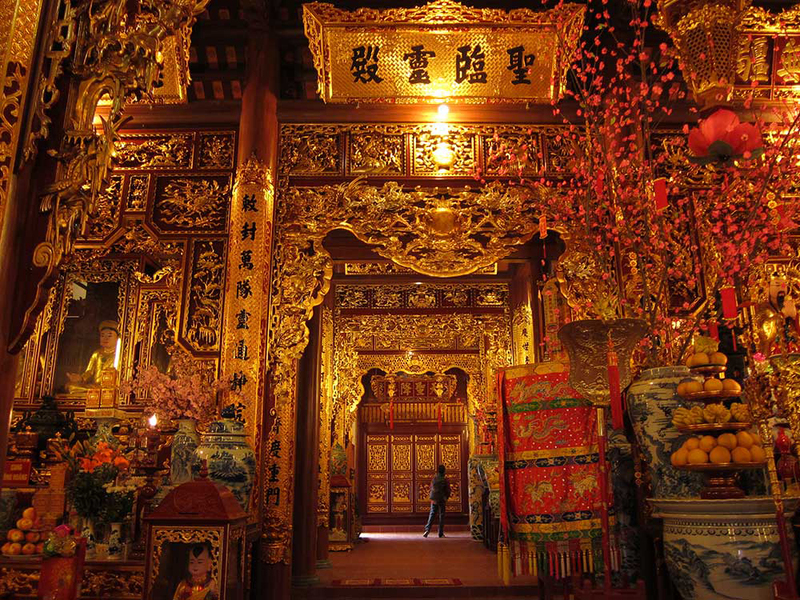 Before you know it you’ll be in Than-Uyên. We stayed at the Hoan Quan Hotel for 200,000. It was clean, had a nice view of the nearby lake, and had hot water. Then we spent more than that at a mechanic, replacing things that I couldn’t even begin to tell you the names of. 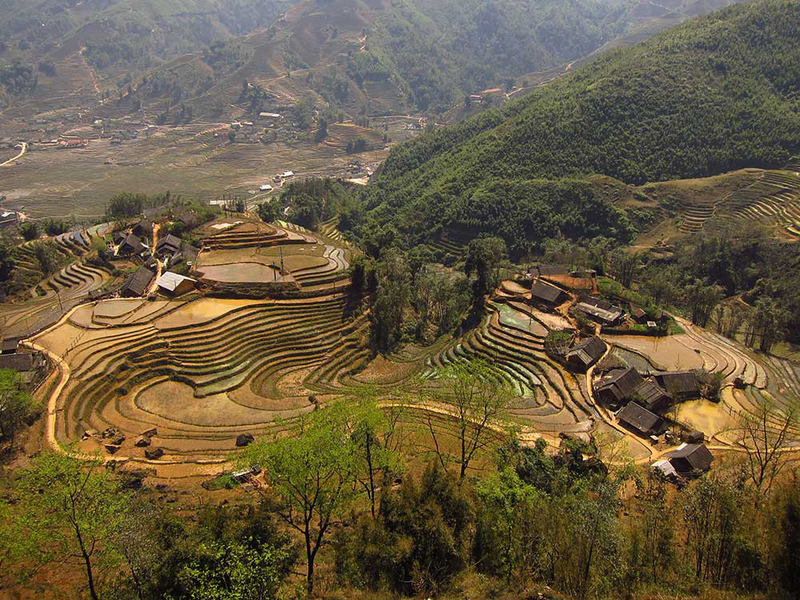 Sapa is a popular destination for tourists, and so you won’t have any trouble finding a place to stay. 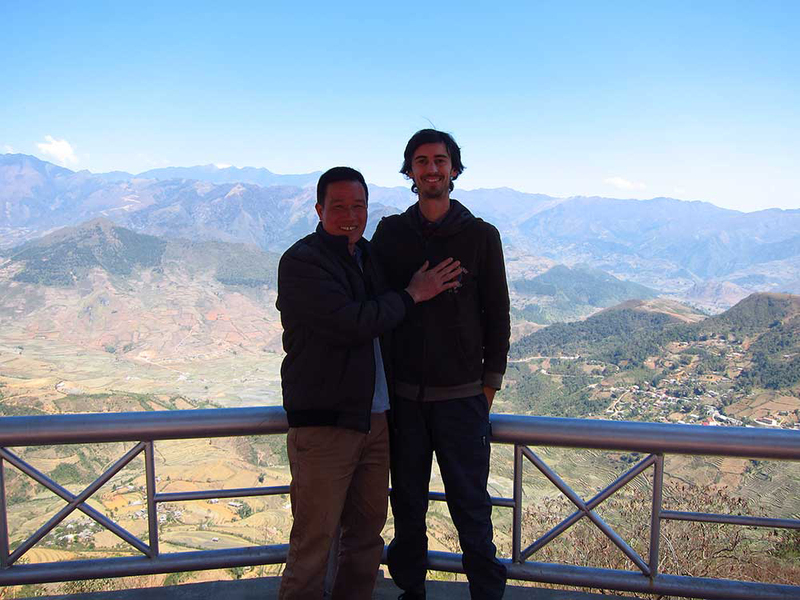 We came here to volunteer for one week at Lucky Daisy’s Bamboo Bar and Homestay. 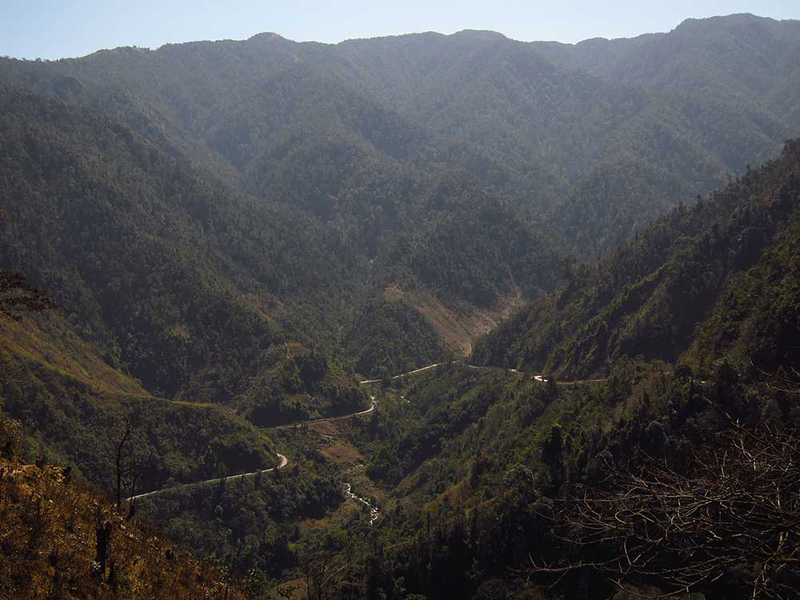 It’s east of town and the 11 km drive has jaw-dropping views of its own. It’s a great place to stay and meet other travelers, or well worth the day trip for the scenery. I wrote about it here. 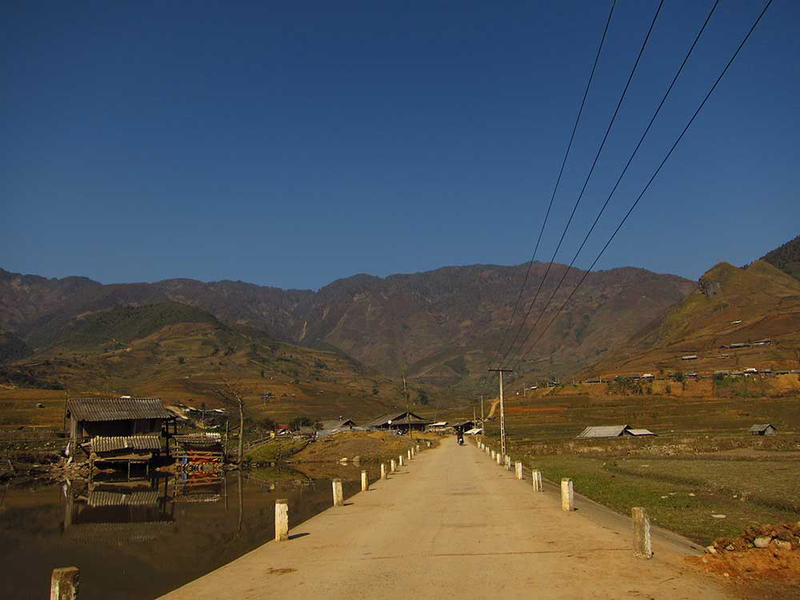 The road down to the H’Mong villages. Well, that’s the end. If anybody reads and follows this guide, I’d love to know about your trip. I’d especially love to know about any alternative routes and extensions you find, since the whole route includes hundreds of tempting side roads and mystery paths. Five days can easily turn into six or fifteen. Google maps is (usually) your friend. Great writeup, and excellent photos! I’ll read the rest of your blog as time allows. Thanks for the write up, looks awesome! I hope to do something similar next year. Hi Marc, you’re most welcome. If you do find yourself somewhere around this area it would be great to hear about it. WE are doing this route thanks to your excellent write up, ive downloaded on my gps already. 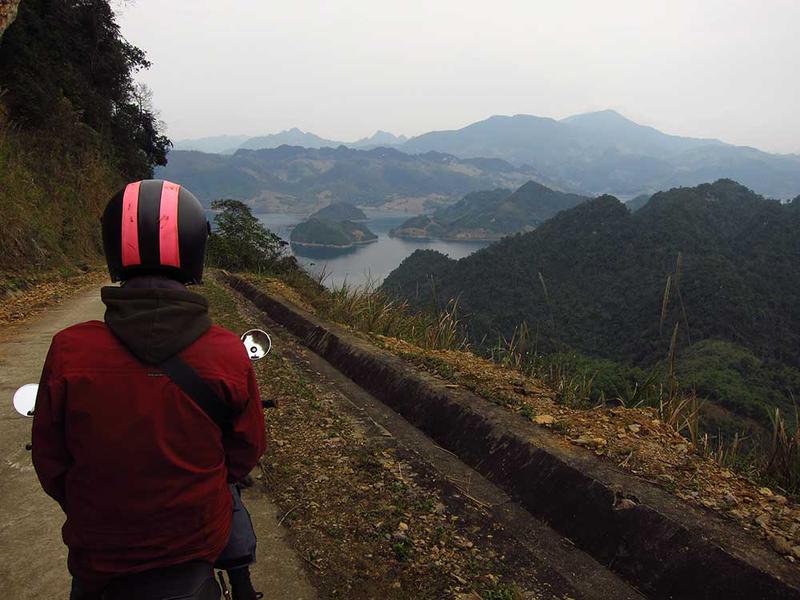 Hi, I’m looking at doing this route very soon – do you have any idea if there is a train back to Hanoi from the end that can accommodate a motorbike or will I have to drive back? 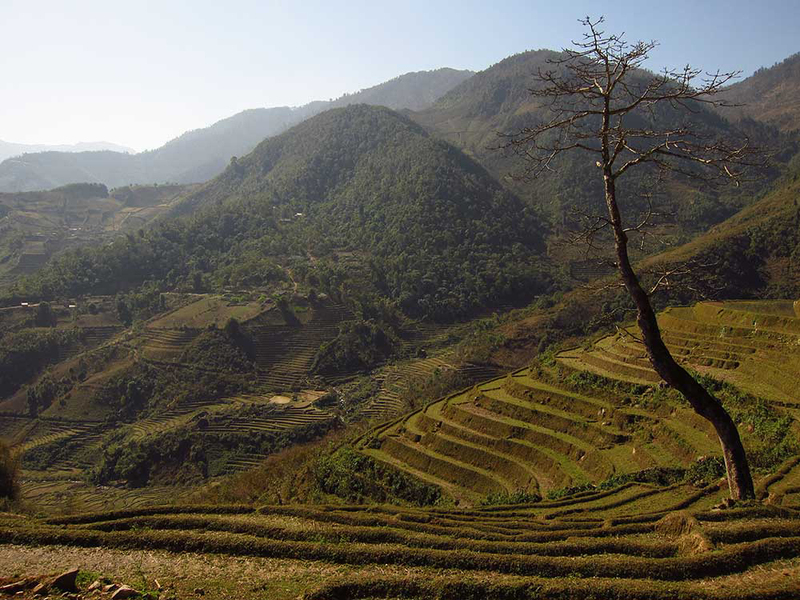 I saw this blog https://www.travelfish.org/transport_detail/vietnam/hanoi_and_surrounds/hanoi/hanoi/38 which talks about putting your bike on the train from Lao Cai back to Hanoi. I am thinking of doing the same thing. Does anyone know how to download the map for this route to my phone? Tom: sorry I don’t know about this, but it looks like Rosie has given you a great answer. Regarding downloading the map, since I’ve made it Google MyMaps have changed some algorithm or something, and I no longer have access to it. Your best bet is to use my map to get a rough idea, and then create your own trip! 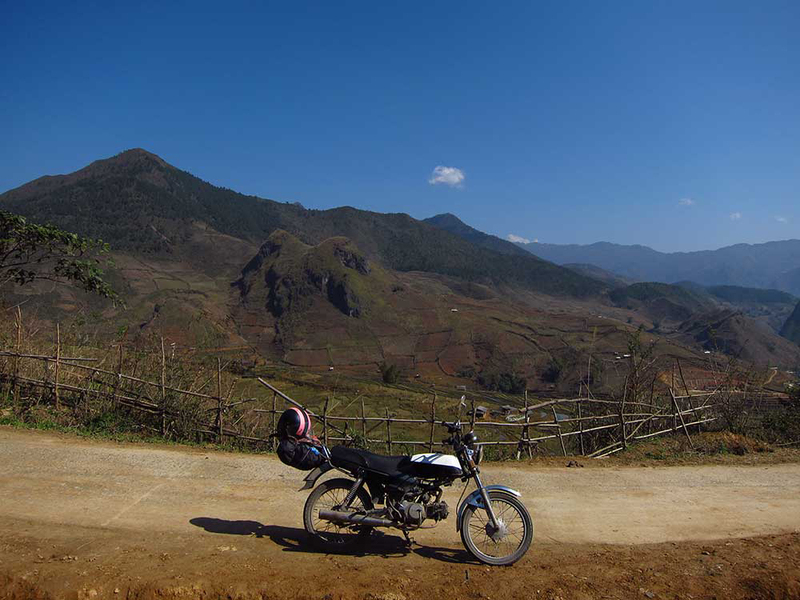 I arrived in Vietnam just over a week ago with absolutely no plan – other than buying a motorbike! Once I got my bike I searched online for a nice route and found this… Decided to give it a go, and w0w it was absolutely incredible! Some of the most beautiful scenery I’ve ever seen in my life! Although it did take me an entire week because my bike broke down on day 3 and it took two entire days to fix! Nightmare!! But it was completely and utterly worth it, every single day was full of jaw dropping views! So thank you guys, and thank Vamp! Cannot recommend this route enough if anyone is thinking of doing something similar!